The development of awareness of the significance of soil erosion in Victoria, and the need for a government response extends back into the 1850s, and is well covered in A Brief History of Soil Conservation in Victoria (Thompson 1979). Over the years various government departments were assigned responsibility for aspects of soil conservation, but it was not until November 1940 that an Act of Parliament set up the Soil Conservation Board that eventually became the Soil Conservation Authority. The functions of the Soil Conservation Board were:- “(i) the prevention and mitigation of soil erosion; (ii) promotion of soil conservation; (iii) utilization of lands in such a manner as will tend towards the attainment of the objects aforesaid”. In January 1944 the Board accepted an offer by the Council of Scientific and Industrial Research (later to be CSIRO) to undertake a soil and erosion survey of an extensive area of country in the Dookie district, and R.G. (Geoff) Downes, then Soil Scientist in the CSIR Soils Division, was appointed to head the survey (Thompson 1979). When the Soil Conservation Authority was created to replace the Board in 1950, R.G. Downes was appointed as one of the three Members of the Authority, and a Research Division was established to undertake research into the following activities. (1) Conservation ecology involving soils, climate, vegetation, topography, land use and other allied aspects. (2) Soil physics, including soil structure and infiltration capacity. (3) Conservation economics (Thompson 1979). Research into conservation ecology commenced with two surveys in western Victoria that involved Board staff and staff of CSIRO Division of Soils. The survey of an area around Coleraine (Blackburn and Leslie 1950, 1958) used soil series as the mapping units, and a survey in the Shire of Kowree (Blackburn and Gibbons 1956) mapped units of land husbandry as described by Downes (1949). A survey of a particularly erodible area west of Melbourne culminated in the mapping of land-use classes (Hexter, Leslie and Pels 1956). 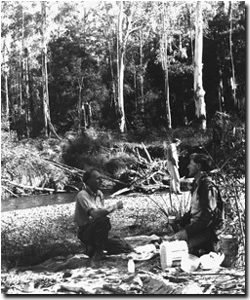 Costin (1957) examined the condition of the high mountain catchments in Victoria, with emphasis of the effects on vegetation and soils of disturbances such as fire, grazing, forestry, engineering works and tourist activities. Under the guidance of R.G. Downes, a program of regional land use surveys designed to cover most of the State was commenced in 1954. The purpose of these surveys was to obtain the information required to determine the best forms of land use for an area and the best methods for its development and combined productivity (Thompson 1979). Graeme Sibley investigating mallee vegetation near Hattah in the early 1960's. This was associated with the Study of the Land in North-Western Victoria by Rowan and Downes (1963). One of the earliest surveys of some 3 000 square miles (7 770 square kilometers) in the Shires Portland, Wannon and Glenelg was carried out by F.R. (Frank) Gibbons, and a comprehensive report that included a statement of the Principles and Methods was published in 1964 - A Study of the Land in South-Western Victoria (Gibbons and Downes 1964). Their emphasis on the need to study the land holistically may be seen as the further development of the approach used by Downes in the Dookie survey. The following quotes provide the philosophical basis for the land-system surveys of the SCA are from Gibbons and Downes (1964). The scale of mapping ranged from 1:10 000 for land-components and land-units, to 1:250 000 for land-systems. Land-system mapping has proved very effective for the coverage of large areas as a form of reconnaissance that can be used to set priorities for more detailed studies if required, or for the identification of areas to be set aside for specific purposes, e.g. as reference areas or wilderness areas as used by the Land Conservation Council in the 1970’s and 80’s. 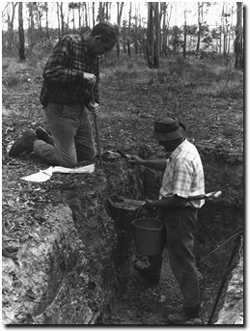 Jim Rowan in soil pit in Bendigo District - 1970's The use of forms of remote sensing of environmental information was explored in an International Symposium on Land Evaluation organised by CSIRO and UNESCO in 1968. A paper by Gibbons et al. (1968) proposed that the land system approach of the Victorian SCA was an effective method for collection and presentation of such information, and emphasised the importance of the human mind as the integrating medium for producing land-evaluation information from sets of environmental information. The responsibility for each SCA land-system survey lay with a single research officer, and the ability to understand and integrate the various scientific disciplines was often considered a weakness of the approach. The Gibbons et al. (1968) paper presented argument in favour of the integrating abilities of the individual. Land-system surveys were also carried out by CSIRO Division of Land Research in northern Australia and later in Papua New Guinea. (e.g. Christian and Stewart 1953). However, these surveys involved teams of scientists with complementary discipline expertise. Their reporting consisted of separate chapters on each of the environmental variables studied, and integration was achieved by consensus between the contributing scientists. In terms of cost effectiveness the SCA approach was superior, and the utility of the outcomes does not appear to have suffered. The amalgamation of a number of Government Departments in 1984 resulted in the SCA ceasing to exist although land-system surveys were still being carried out. “A study of the Land in the Campaspe River Catchment” was published by the Land Protection Division of the former Department of Conservation, Forests and Lands, the new Department at the time. “A Study of the Land in the Catchment of the Gippsland Lakes” was the only survey in the series that used a team approach and it was the second last of the series. The report was published in two Volumes by the Land and Catchment Protection Branch of the former Department of Conservation and Natural Resources. Volume 1 contained broad descriptions of the study area the climate, geology, geomorphology, soils, native vegetation and land uses. Volume 2 contained the land-system map, and descriptions of the characteristic features of the eighty-four land-systems, together with specific information on the climate, geology, soils, vegetation and land use. The incidence of and susceptibility to various processes of land degradation are also presented for each land system. A number of surveys were carried out at the land-unit scale to provide environmental information for use in local Government planning e.g. at Wilson’s Promontory (Sibley 1966), in the Yarra Valley Catchment (Van de Graaff and Howe 1976), in catchments to the north of Melbourne (Jeffery and others 1979 - 1981), and in the Loddon Valley (Schoknecht 1988). Despite the large number of areas surveyed by 1975, about one third of the State remained un-surveyed. To complete the statewide coverage as quickly as possible, a rapid reconnaissance-level mapping was undertaken using the basic principles of land-system surveying. The maps that were produced by this approach were fondly referred to as “Mud Maps” as they were acknowledged as having lower reliability than those in areas that had been thoroughly surveyed. The next stage of preparing the statewide coverage was to bring all the separate survey data and mapping together. Because of the flexibility associated with the basis of the land-system mapping, there was a lack of consistency in the main criteria chosen to determine the basis of the mapping units. These were influenced by the anticipated principal uses and the features that offered the best discrimination of areas with different use potential. The task of bringing all the mapping to a common scale, correlation of the map units and co-ordination of the map-unit boundaries where survey areas met, fell to J.N. (Jim) Rowan. A new system for combining the disparate land-systems was developed based on broad geomorphic units as defined by colleague J.J. (Jeff) Jenkin (1991). SCA staff south of Goongerah in East Gippsland - 1970's - pictured: Ken Rowe (background), Frank Gibbons (near left) and Bruce Nicholson (near right). This culminated in a report -“Land Systems of Victoria” (Rowan 1990) - that was published by the Land Protection Division of the former Department of Conservation and Environment and the former Land Conservation Council of the same Department. In 1975 the Authority decided to develop procedures for assessing land capability for a wide range of land uses using the data produced through the studies of the land. These were intended to contribute more directly to land-use planning. A review of land evaluation systems in USA and Europe was carried out by Principal Research Officer F.R. (Frank) Gibbons (unpublished 1976) and the approach recommended was a system based on that used by the USDA, referred to as a “limitations system”. It required identification of the main limiting factors associated with an area of land when used for a specified kind of use, given productivity and sustainability requirements, and establishment of scales of degree of the limitation imposed by those factors. A set of guidelines for land-capability assessment in Victoria, based on this approach, (Rowe et al. 1981) was prepared and used to develop land-evaluation procedures for a number of local-government planning schemes under the guidance of the former Department of Planning. Other applications were being developed when the major re-organisation of Government Departments interrupted further development. The land surveys for local government were the basis for land-capability assessment for major land-use activities, associated with serious planning issues at the time, notably erosion risk associated with subdivision of rural land for “rural residential development”, sometimes referred to as “hobby farming”. The land capability assessment procedures presented in “The Guidelines” were intended to be a framework for ongoing development, with further development through feedback from users and focussed research to provide data on the relationships that were at the heart of the process. A review of the Victorian land-capability assessment approach (Lindsay and Rowe 1990) drew attention to the inadequacies of the limitations approach, notable the difficulty of defining the interactions of the environmental variables, and the problem of dealing with “off-site” effects, e.g. how to predict the off-site effects of domestic waste-water disposal through soil absorption. The data from many of these studies remain unpublished and are held as internal departmental reports. Many were held in a series referred to as the 'FR' Series that was held in the Authority library. They are listed in the References.